Life on Mars and Ashes to Ashes have confounded us and intrigued us in equal measure, but this week marks the end of an era and the swansong of an icon, as TV’s most sarcastic cop, Gene Hunt, played by Philip Glenister, bows out in the last ever episode of Ashes. 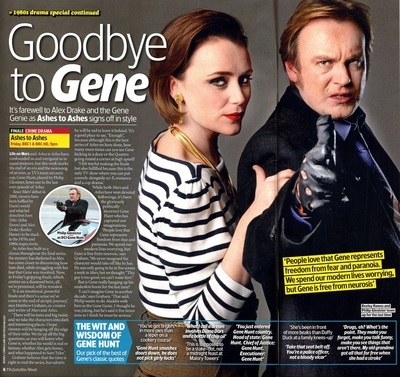 Since Mars’ debut in 2006, viewers have been baffled by Hunt’s world and what led detectives Sam Tyler (john Simm) and Alex Drake (Keeley Hawes) to be stuck in the 1970s and 1980s respectively. As Ashes has built to a climax throughout the final series, the mystery has darkened as Alex has come closer to discovering how Sam died, while struggling with her fear that Gene was involved. Now, in Friday’s gripping finale, which centres on a diamond heist, all, we’re promised, will be revealed. Gene Hunt smashes doors down, he does not pick girly locks! Take that seatbelt off. You're a police office not a bloody vicar! You just entered Gene Hunt country. Head of State: Gene Hunt. Chief of Justice: Gene Hunt.